Successful people often have common personality traits and habits. Certainly hard work and determination is part of the mix, but for those that are successful and content, there’s something more. You’ll find that for these people, there’s a passion for the work they do, a dedication to stay the course, and a willingness to listen to the ideas of others. 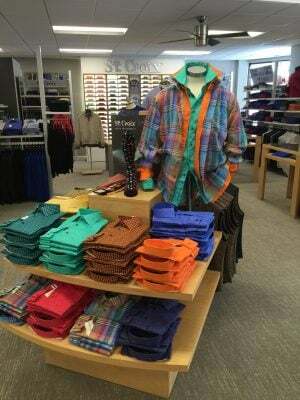 All these traits (and more) are found in Owner of Mr. B Clothing, Tim Sitzmann. A service-driven organization has to function differently than a business just focused on moving product. There must be a passion for what you’re doing that pushes you to seek something more than just a sale. And that’s what sets Mr. B apart from many in the retail business. Tim’s passion for the business and the industry in general sets the tone for his team, and it’s clear that he’s a thoughtful leader focused on more than just the bottom line. “As a team, we talk about our core values all the time. Are we willing to be in the service industry, and do we understand what that really means? It means doing what it takes and putting our customers first, making sure they understand and know that you care about them,” Tim said. For Tim personally, what he loves about fashion is the flexibility. 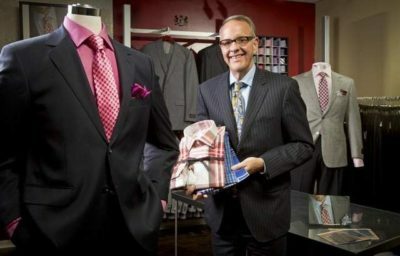 While he loves to wear a suit and tie to work, he also loves a nice T-shirt and a pair of jeans. He enjoys the change that clothing offers. And getting new product for the store is like Christmas every day. There’s always something new and exciting. That same idea influences Tim’s approach to selling. He doesn’t have a favorite item to sell, instead, he tries to build a foundation for his customers to work from. Starting with simple, classic pieces is the way to go, then add color and vibrancy after. He’d always recommend four key things: a dark suit, sports coat, great pants, and then knitwear. Pride is something that Tim feels as well. He’s proud to still be in business when so many of his peers are not. To be in any industry for 40 years, and to be thriving and healthy, is an amazing accomplishment. Tim would be the first one to shun the spotlight and focus the attention onto his team at Mr. B instead. But nothing thrives without a leader, and we’re proud to shine the spotlight squarely on Tim Sitzmann for his passion and dedication, and wish our friends at Mr. B continued success!